The sequel to mega-hit Miss Peregrine’s Home For Peculiar Children renews Riggs’ efforts at combining Young Adult fiction with vintage photography. Set in 1940, this sequel finds protagonist Jacob departing from his island home for the bleak streets of World War II-era London. If fans of Riggs find it half as enthralling as its 2011 predecessor, it will have been worth the wait. Former Los Angeles Times reporter and current UC Irvine English faculty member Erika Hayasaki reports on an unusual college course where death dominates the syllabus. Following the class’s instructor, Norma Bowe, over the course of four years, Haysaki immerses herself in a world where a college instructor teaches death in order to change lives. Ex-Purgatory continues the story of superheroes protecting Los Angeles from apocalyptic forces, a plot established in the first three novels of the Ex series. Bestselling author Peter Clines continues to mesh fantasy, science fiction, and his own interpretation of the End Time in his newest novel. Lifelong star actress Drew Barrymore exhibits a series of photographs that share a common theme: the heart. Where Barrymore could find a heart—in grass, in clouds, in her dog’s fur—she pointed her camera, and the result will delight the sentimental. Barrymore fans can now share in what the actress refers to as “moments of magic:” the appearance of the heart in unexpected places. Robert Gates recounts his days as Secretary of Defense during the wars in Iraq and Afghanistan. Spanning both the Bush and Obama administrations, Gates fills over 600 pages with a behind the scenes look of the politics and decision-making surrounding a contentious period of American history. 2014 begins with the paperback release of Kushner’s critically acclaimed The Flamethrowers: A Novel. Named by the New York Times as One Of The Ten Best Books of the Year, The Flamethrowers was also nominated for the National Book Award. Kushner’s latest novel, originally released in April 2013, follows a young artist through Rome and New York in the 1970s. 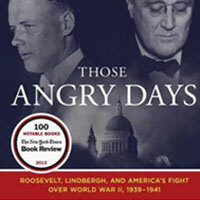 Another paperback edition of an already bestselling hardcover, Those Angry Days revisits the great debate between American intervention and isolation in the days leading up to World War II. Olson uses the narrative of two clashing American figureheads—FDR and Lindbergh—to recreate a tumultuous era with the creative finesse of a novelist.